Good morning from the most beautiful city and welcome to Varengold’s Daily FX comment. The week starts with a strong EUR and positive economic data from the Far East. Anyways, we hope you had a great weekend and wish you a successful trading week. Japan’s gross domestic product expanded more than expected after it climbed 4.8 percent annually in the third quarter, the Cabinet Office reported today in Tokyo. Optimism on a global recovery climbed the demand for higher-yielding currencies while the EUR climbed against the USD and the other 12 of the 16 most-active counterparts. The weak and low-yielding USD fell against a basket of major currencies after Asia-Pacific leaders pledged to maintain more stimulus measures until there’s a constantly growth. The EUR climbed against the JPY and reached a high at 134.15. It climbed for the second day against the USD and reached a high at 1.4970 on the way to its long-term resistance of around 1.5060. This month the Federal Reserve repeated its intention to leave interest rates unchanged for “an extended period” as long as inflation expectations are stable and the unemployment rate fells. Fed Chairman Ben S. Bernanke will speak today on the economic outlook in New York. The USD-Index, which uses the U.S. currency against six major currencies including the EUR and the JPY, dropped 0.4 percent to 75.035. 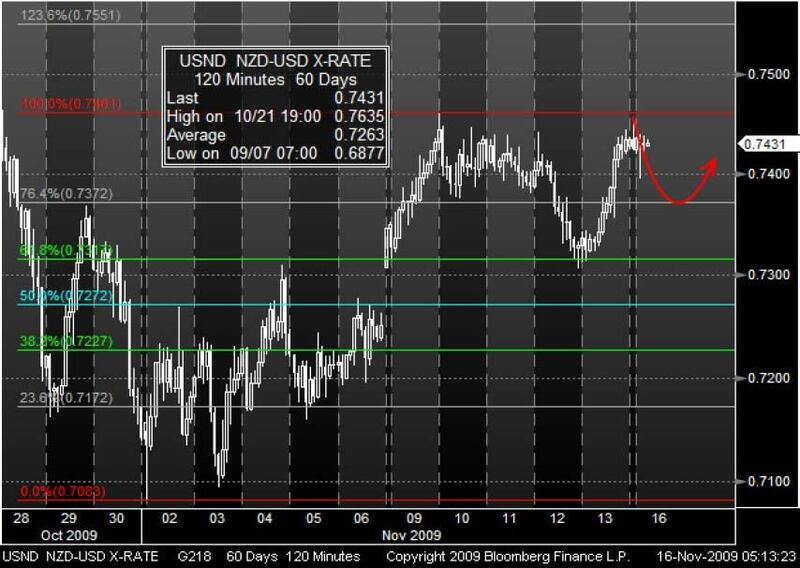 As you can see, the Fibonacci retracement lines seem to be a significant indicator for the movement of the NZD/USD since the end of October. After the market touched the 0.7461 (100%) resistance, the market pulled down, touched the 61.8% support and pulled back and got resistance back on the 100% level. This might be a sign for a repeatedly rebound toward the next Fibonacci support, which is the 0.7372 level. 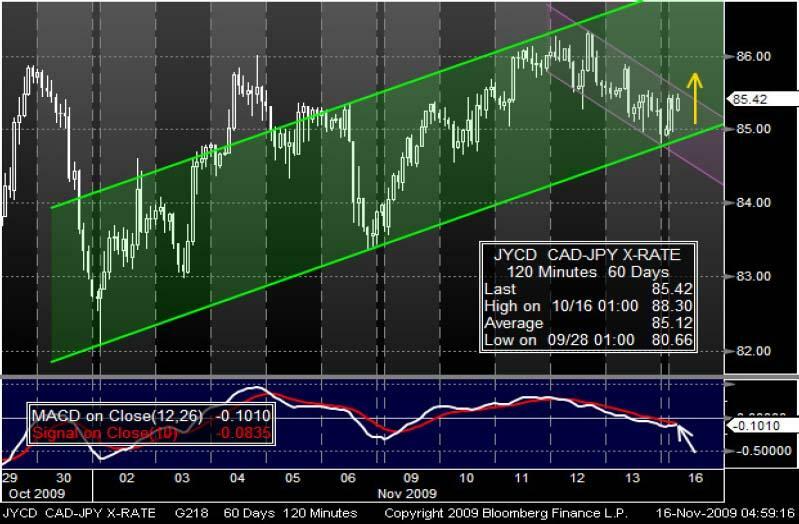 The CAD/JPY has been moving inside two trend channels. After getting support from the lower line of both channels on Friday, the market pulled up to the upper line of the bearish short-term trend channel. Furthermore, the MACD seems to be on the way to show a bullish market. If the market breaks the bearish channel, it may reach the upper line of the middle-term green channel.